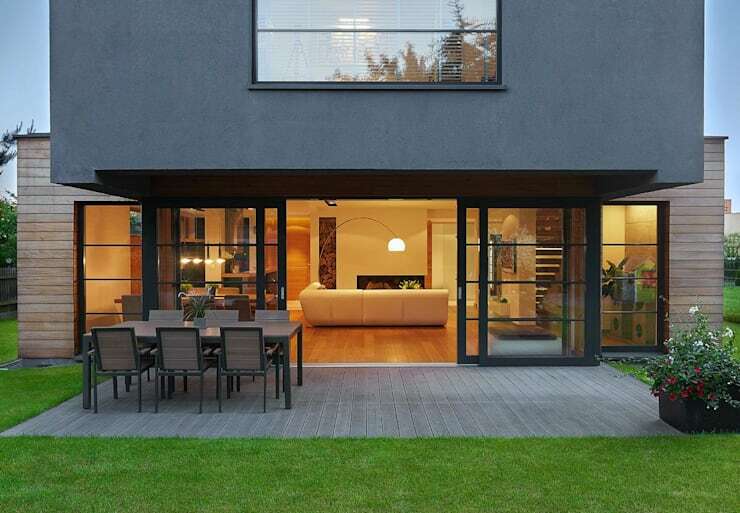 Architect professionals Archipunktura Architekci Detalu are all about trendy modern homes with a touch of warmth and personality. Today, we are going to visit a luxurious family home that is neutral, chic and stylish with a strong splash of charm. We will learn how we can create a home that finds the fine line between functionality and trend! As Ferdinand Porsche said, Design must be functional, and functionality must be translated into visual aesthetics without any reliance on gimmicks that have to be explained. If we look at the home from the outside, we can see how the modern facade features a grey plastered wall on the top level of the home and a wooden and glass section on the bottom level. This allows for the bottom area to be open and spacious, spilling out onto the terrace and garden area. This also allows sunshine to filter into this living area. The top level features glass to, but it is more conservative. This makes for a more private space where the bedrooms and the bathrooms are housed. If we head inside to the kitchen, we come across a very stylish kitchen with sleek black kitchen cabinets, white floors and touches of caramels and chocolates here and there. You can see that this kitchen is very minimalist, with only the most necessary of items on the kitchen counter tops. This is thanks to the fantastic kitchen storage spaces that the designers have invested in. This ensures all crockery, cutlery and glassware can be stored neatly out of sight. The designers also opted for silver kitchen appliances that add to the smart and modern ambience. 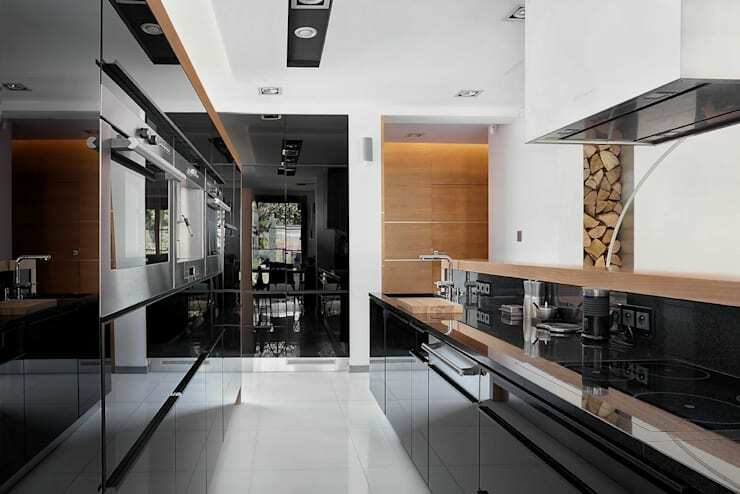 If we zoom out of the kitchen, we can see how it opens up onto an expansive living room and dining room space. The interior features white walls and light wooden floors, creating a very warm and neutral interior. The furniture fits into this style, adopting the same neutral colours. However, we can see a splash of colour here and there in the form of a green cushion and a gorgeous vase of flowers. Tip: Put a fresh vase of flowers in any room of the house to instantly brighten it without overwhelming the space. There is a long rectangle nook in the wall next to the fireplace, which provides a storage area for logs of wood. Not only is this functional but it creates a beautiful design element. Do you see how the designers find the balance between the two? If we look at these stunning stairs in the home, we can see how they too add a functional yet decorative element to the home. 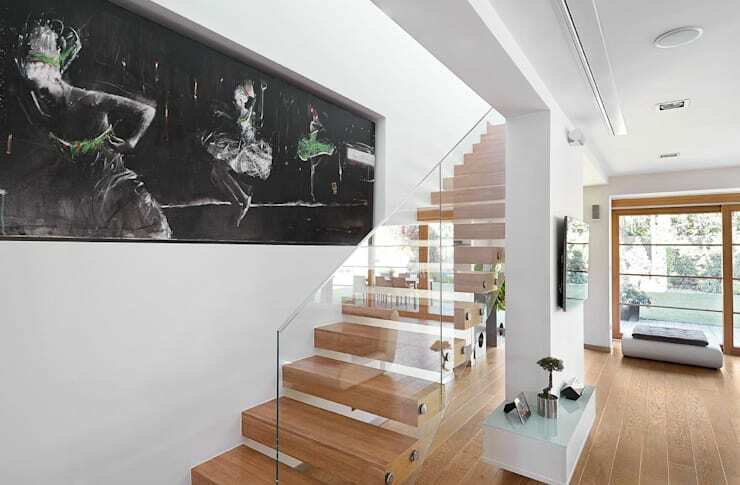 The wooden stairs seem to float up to the second level, while the glass railing adds a very trendy and modern edge to the space. Wooden staircases are a wonderful addition to any home. Have a look at these other wooden staircases that wow. On the wall, there is a very impressive piece of artwork, which brings life and soul to this home. This is very important! Your home is an extension of who you are, so it should feature pieces of artwork or photographs that speak to you and your family and who you are. 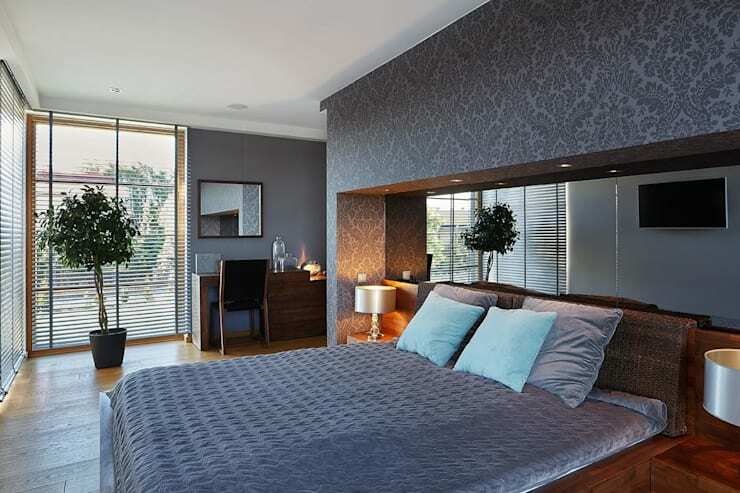 If we head into the bedroom, we can see that the designers have included some cool colours, including greys and blues. This creates a calm oasis where the resident can relax and regroup! The bedroom is quite large, with large glass windows that allow for sunlight to stream into this space. There is also a long mirror behind the bed, which reflects the room back on itself. This visually expands it, making it look that much more dynamic and spacious. There is a little office nook on the one side, giving the residents a little spot where they can attend to paperwork or do research on their computers, in the comfort of their own bedroom. In the corner of the room, there is a little tree that brings a bit of natural beauty to the space. 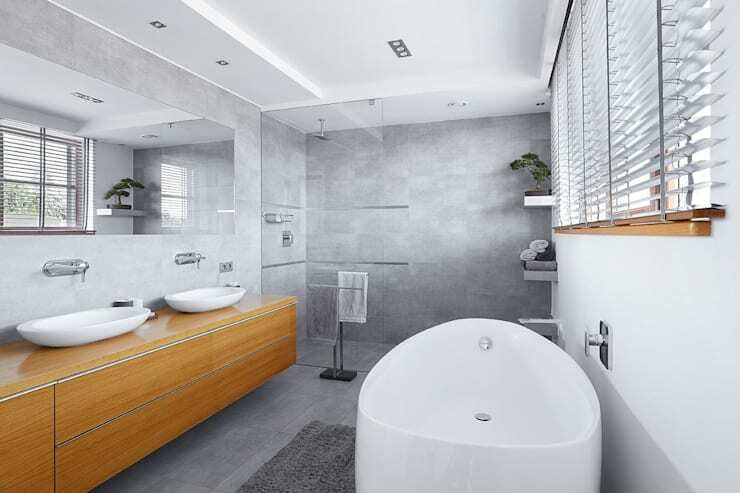 A bathroom should never be overlooked when it comes to a modern home. It's a place in the home where you spend the most time! In this bathroom, we can see an incredibly modern design with very stylish basins and bathtubs and a shower that looks like it comes from the future. Don't you think the glass sheet that encloses it makes the room look so much bigger than it truly is? The designers chose grey as the dominant colour in this space, but broke it up with white and a light wood. This makes it a very warm and cozy space! Like the kitchen, we can see that the bathroom is very sleek and minimalist. The designers have installed a cabinet under the sink as well as shelves on the wall, which keep items like towels stored neatly away. Every last detail has been thought of!